Legal translations are part of many companies’ daily work and are directly related to the activity of several departments. The Human Resource Department may require the translation of employment contracts, non-disclosure agreements and insurance policies, among others. 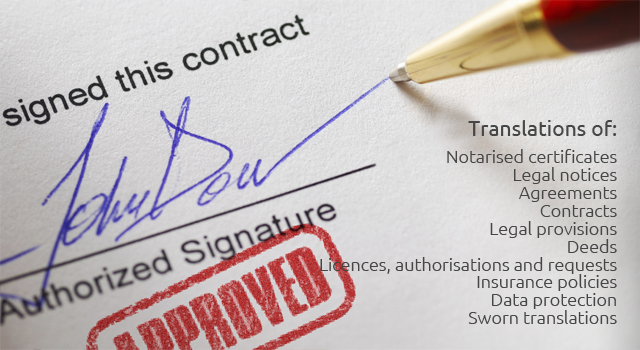 The Administration Department may also need the translation of notarised certificates and powers-of-attorney, legal notices, deeds and articles of incorporation; for their part, the Logistics Department may need the translation of licenses, authorisations and requests, or of processing and registration documents. At Planet Lingua, we have been working for years with Spanish companies with interests abroad as well as with foreign companies with interests in Spain, which makes them translate their documents in order to be up to date with the bodies of the targeted country. Experience has made us highly aware of the relevance a good legal translation has for your department, of the care and discretion with which you have to manage this type of translations, as well as of the disastrous consequences a bad legal translation may entail for your company. At Planet Lingua, we offer you advice so that to know which type of translation you need for your legal documents (legal or sworn) and we are fully available to ensure that all files are adapted to the specific requirements of the country where you are going to submit said documents.